Thanks. I had the advantage of having read many of OP's previous posts and threads he's started and I've also taken part in the recent thread that was supposed to be about what nurses can do to make patients safer, but that pretty much immediately morphed into something else. That and my previous career in law enforcement, where you regularly meet people (criminals) who are quite fond of playing, or at least trying to play, mind games. I'm not the most trusting person and my radar for deceptive behavior is pretty finely tuned. That's not necessarily a good thing though, it's simply a consequence of my previous life/work experience. It's better to have more faith in mankind, so I hope no one feels bad if they assumed that OP was being honest. That's in my opinion a healthier default assumption than my cynicism. Kyrshamarks, trying to prove that people are wrong in this way is in my opinion quite underhanded and simply not nice. If you really had a solid argument to make, you could have made it in the existing thread. Without attempting to deceive people. 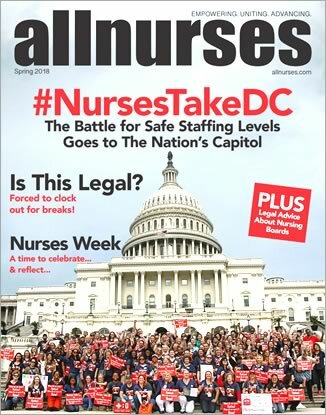 Since you simply copy-pasted the better part of an article (why didn't you include that last paragraph, I found it quite informative....) from a conservative magazine and didn't add a single comment of your own, I take it that you're not interested in sharing your own personal "nurse opinions" on this matter? Are non-medical magazines with a political, ahem..., inclination where you normally go to find medical and epidemiological data? That article that you copy-pasted mentions something that epidemiologists in Germany have supposedly reported, yet there is no link provided to the actual report. Why is that? Perhaps since you deemed this article important enough to share with us, you could find that epidemiological report? I tried and was unsuccessful. I found it quite humorous that tularemia is mentioned in that long list of scary-sounding diseases. You know how that one got its name, right? (Not from Tulare, El Salvador...) It a pretty rare disease, but it seems that the disease occurs between the 30th and 71st parallel north, so those poor Guatemalans and Hondurans are more likely to catch it if they come to the U.S., Germany or Sweden, than if they stay at home. Tularemia - Wikipedia Regarding migrant health in the European region... WHO/Europe | Page not found (For some reason it says "page not found", but the link appears to work, at least for me). I'm entirely convinced that upsetting bleedin' hearts is a goal in itself and an extremely enjoyable experience for a certain segment of Trump supporters. Of course not every conservative and not every Republican, but some of Trump's most ardent supporters, sure. I think they welcome cruelty as long as it's directed at those brown "others". I don't think they're in the least bit bothered by seeing the image of a mother in flip-flops running away from a cloud of gas dragging along her two very young daughters in her hands. Do you have any credible data to show us which supports that the "vast majority" aren't legitimately claiming asylum? I ask, because the YouTube clip that you linked to in post #141 in this thread doesn't qualify as evidence for the reasons I explained in post #147. You never commented on my post :) Of course deploying tear gas is an act of violence. Lachrymator agents are chemical weapons. As someone who's inhaled a snoutful of OC gas during training, it's a terrible experience. It causes intense pain (corneas and nasal passages/airways), increased secretions, a powerful choking sensation and causes disorientation and significant anxiety. The feeling that you can't breathe tends to do that... The question isn't if the border guards used violence or not. They did. The question is whether it was a justifiable use of force, or not. Anyone who has worked in any capacity related to law enforcement can, if they happen to be in a sharing, honest mood, tell you that some people are more likely to end up in altercations than others, more often find themselves in situations where suspects resist arrest and generally appear more talented at escalating volatile situations than at defusing them. I'm not saying that individual border agents are to blame for this, but the outcome could likely have been prevented before it ever escalated. The stage was set over a month ago, when the deliberate fear-mongering campaign about the looming "invasion" saw the light of day. In my opinion it took some skill and deliberate planning to CREATE the right circumstances for this cluster F to occur at your border. Caravans of migrants have been coming to your southern border for years, and as far as I know there's never been a situation where tear gas was used before now. So why now? What's changed? A good starting point would be to start processing asylum claims extra slow, like only a hundred per day, when you've had plenty of advance notice that thousands of migrants and asylum seekers are on the way... You then have a large group of people camping out under what's likely rather crappy conditions, with frustration and desperation increasing by the hour. Closing off a bridge, making access harder is another way to frustrate people who've walked 1,000 miles and finally reached their destination.... How many of you would voluntarily wade through what's basically liquid, stinking sewage mess masquerading as a river, carrying your kid and his/her stroller? I know I wouldn't. I see that as an act of desperation. As someone who has actually worked in riots I know not to 100% judge a situation when I wasn't present, but I can share my impressions. I'm not downplaying the damage stones/rocks can do if the people throwing them are close enough and you're unable to take cover. I've had rather largish stones thrown at me, and if they make contact they hurt like ****, even in full riot gear. If they're big/heavy enough, they can knock you over and/or seriously injure you. I've looked at the scenes at the border and I don't see anything that warrants deploying tear gas in the direction where there are clearly children present. Does anyone have any actual footage they can link to that shows a situation with significant rock throwing actually making contact and injuring border agents? I'm not saying it never happened, I'm saying I haven't seen it. Seriously? From what I saw, correct me if I'm wrong, the gas was actually deployed across the border into Mexico. The migrants I saw on TV weren't at the border or across the border in the U.S., they were still in Mexico, admittedly in close vicinity of the border, but not on it. Am I wrong? Do you seriously think that the adults with children were actually planning on STORMING the border, as in forcing their way past all the obstacles in their way, humans in the form of armed guards as well as structural obstacles? Are you aware that according to international law and U.S. law, people actually have a legal right to present at the border and request asylum. There's no guarantee that they'll be granted asylum, but they have a legal right to have their case heard. The thing is though, that a person has to actually show up somewhere along the border and talk to an official/representative of the country they're seeking asylum in, in order to do this. If a person is met by tear gas as they approach the border, that becomes a bit difficult to do.... What is it that you think should stop coming? The caravans? Every single asylum seeker? It is legal to come to the border and apply for asylum. How do you know in advance who has, and who hasn't, legitimate grounds to seek asylum? Isn't that exactly why most countries a process where people state their case at the border (like you used to have), so that it can be determined if an individual qualifies for asylum? This latest development is in my opinion extremely troubling, but sadly completely expected. I think this is a way for Trump to look "tough" and "strong" for his supporters. In my opinion, it's a wholly man-made crisis. I think this is separating young children from their parents, the sequel. Tear gassing young children. Ought to have decent deterrent value. Another low point from an administration rife with them. What's so interesting about that clip? Care to spell it out? I wish you'd stop insulting our critical thinking skills by posting links like these. As I'm Swedish I was already aware of this filmmaker before you posted the link to a more recent endeavour of his. Ami Horowitz - Wikipedia He released a so called documentary in 2016 about immigration and crime in Sweden. Many of the statements in his film seem to have been described as false by fact checkers as well as by Swedish authorities, news outlets and criminologists. The following are articles from Swedish media that cover some of the reporting on the documentary. He filmed the police interview for Ami Horowitz that Trump saw: The material was not edited ethically - DN.SE Swedish police featured in Fox News segment: Filmmaker is a madman - DN.SE Six claims and facts about Sweden: a closer look at Ami Horowitz' report - The Local As far as I understand the articles I've just read, the two policemen that were interviewed have said that the film had been edited so that their answer to a certain question the filmmaler asks, are in fact replies to a different question. So they are asked question A and they replied B. They're then asked question C and they reply D. Only according to them, the documentary shows the filmmaker asking question A, directly followed by reply D. The police's version of events appears to have been corroborated by the two cameramen hired for the filming of the documetary. One of them has reviewed the raw footage to make sure that his recollection was accurate. I never watched the "Swedish crime" documentary myself, but I'm guessing this is the same filmmaker as the one in your clip?? Please let me know if I'm wrong. Now to the YouTube clip you linked. There's a taped phone conversation/interview between 4:07 and 4:55. The woman he's interviewing doesn't even seem to be answering the questions we're hearing in the clip. To me the conversation sounds off and that yeah followed by laughter at the end, could be the response to anything. Perhaps it's only me who doesn't think the dialogue "flows naturally", I don't know. At 5:14 he says that at the base camp there's a mobile hospital stocked with enough pharmaceutical drugs to make Keith Richards blush. At the same time the camera shows a table stacked with various medications in boxes. The quality of the film is rather poor but the ones I can make out are Metronidazol, something called Bistatin-F and what looks like Indomethacin. There's also a Diclo???? something or other. Yeah, I bet they'd excite the **** out of Keith Richards. This is followed by him saying there's also plenty of doctors and nurses attending to all the migrant's needs. Imagine that... Doctors and nurses tending to people with medical needs. The world really is going to hell in a handbasket. One of my favorite parts... Directly after this at 5:25 the camera shows him standing in front of a man who may be Hispanic and who may or may not be a member of the "caravan", and he says the following to Hispanic-looking man; America also has very generous benefits for people who live in America, is that something you want to take advantage of as well? Then directly after that the camera shifts to showing ONLY the Hispanic-looking male in the picture frame giving a short reply, and all of a sudden a gigantic concrete pillar has materialized behind the man... (It's magic, I tell you). That pillar WAS NOT THERE when the man was asked the question a second before (well, a second before on the clip at least.. :sarcastic:) There are more instances in the clip where we see people (who knows who they are, how can we possibly verify who they are?) answering questions, when we don't hear the question being asked before the replies (for example 6:46 - 7:06). How can we be certain what they're giving responses to? SC_RNDude, do you think we're stupid? Please be a bit more critical of your sources. Remind me again, what did you find interesting about this clip? What do you think it shows/proves? What comes to mind when you hear Donald Trump ? Could you please post links to the criminological research that shows that the political "left" are more prone to violence and commit more assaults, bombings and murders than the political "right"? I have no intention of doing that. Why would that shock me? It's what I expect. The difference is that I recognize that having these feelings towards others, is a sad thing. I don't take pride and revel in it. Again, show me the evidence that supports your claim. Because you know, I distinctly remember several occasions when I've had to fight with aggressive violence-prone nazi types. While they've healed by now, I certainly had the bruises and the busted ribs to remember those festive events by. Do you seriously think that only left-leaning perps shoot at the police? That's kind of funny. I've never posted a meme in my life. I'm not about to start now, so I'm not sure what you're saying, The crime stats I don't need to research. I already know them. No kidding. I'm not really that bothered by your lack of civility, but somehow one expects a slightly more refined level of discourse on a nursing forum. But hey, it's kind of nostalgic. It reminds me of the white noise I'd hear from the cells back when I worked in police stations. Since this is the tone you've chosen to strike, I hope you don't mind if I don't address you as politely as I would someone who writes in a less inflammatory fashion. This is horribly poor logic. You can find examples of people on both the right and the left, as well as people with no particular political preference, who are guilty of the things on your list. I don't even have to go look for sources to corroborate that. With a sample size of over 300 million people, it's pretty much a statistical certainty. What is the point of your list of bad acts? What do you think you've proven? The fact that there exists bad apples all across the political spectrum isn't the issue. One party has a leader who calls Mexicans rapists, who supports policies that seperate even very young children from their parents becuase their parents are suspected of having committed misdemeanors, who says that a judge can't be unbiased because of his Hispanic heritage, who tweets extremely rude insults at all hours of the day and night, who brags about grabbing women between their legs, who admires and cozies up to autocrats who terrorizes and murders their citizens, who expresses the opinion that there is such a thing as nice white supremacists even after a young woman has been brutally and deliberately mown down by a car, who kicks people while they're down as they are fleeing their homes and in some instances getting killed in raging wildfires, who disparages Gold Star parents when they dare express something less than adoring admiration towards him, who repeatedly attacks and attempts to undermine the credibility of the free press (that is an absolutely vital component of a functioning democracy) and continues to single out and target specific media outlets and individual journalists even after they've been sent bombs in the mail by an unhinged supporter. The other party doesn't. There is no equivalency. Some of the worst despots in history were actually elected. Thankfully, history is full of examples when people didn't view that as "taking their turn", but instead had the backbone to fight for freedom, democratic values and respect for all human beings. I must say, that for you as a nurse to make fun of and show condescension towards people who cannot afford medicine, is pretty darn sad. You seem to be feeling a whole lot of contempt for your fellow man. Does having this attitude contribute anything positive to your life? The reason I ask, is that I feel the same level of disdain for people who STILL support Trump. I wish I didn't have those feelings because I don't consider them something to be proud of and they lessen me as a human being. It's safe to say it's one of the uglier aspects of my personality. I don't feel threatened by a difference of opinion either. While it's true that a difference of opinion could actually pose a threat, if enough people shared it and the opinion they shared was corrosive enough to dissolve the fabric of your democratic society, opinions isn't what have me feeling quite scared for you all and the rest of the world. The thing that scares me more than anything is that you/we no longer agree on verifiable, demonstrable truths and facts. In my opinion it started when Spicer angrily claimed in January of 2016 that the inaugural crowd was the biggest ever. PERIOD. Trump's inauguration crowd: Sean Spicer's claims versus the evidence | US news | The Guardian It's only gone downhill from there. The posting of links to sources that peddle outright lies. The starting of threads that cover the latest fake topic that those in power want to foist upon you. And how they abandon that thread as soon as the administration and the more extreme elements of the right-wing do so. It is so obvious when the lie du jour has oulived its usefullness.. They are so clearly a megaphone helping the propaganda department along. This is the threat and this is what infuriates me when I read posts made by the staunchest Trump supporters on this forum. I can't call them out by name, because that would likely be viewed as a personal attack. I wish I could, because I much prefer being straight with people and giving them a chance to respond and explain if they want to. Difference of opinion I can handle. The perpetuation of lies and conspiracy theories that threaten to tear your country apart, is a different kettle of fish. I find some Americans so very naive. I'm Scandinavian and of course that also makes me a European. I've lived in over a dozen countries, both as a child and as an adult. I've lived in several European countries apart from my birth country. Europeans have had two devastating world wars on their soil in the last ~hundred years. We've also seen the rise of several fascist or authoritarian regimes. We've had Hitler, Mussolini and Franco. Millions of people killed. Several countries have had civil wars during the twentieth century. We've had the iron curtain that split our continent in half. We've experienced genocide as recently as the nineties. Today we're seeing troubling signs of authoritarian leaders gaining power in many of our countries and a growing intolerance towards the "others". With the sum of that collective experience affecting how I interpret the world, what I see happening in the U.S. really frightens me. While you as a country have participated in many wars, no one alive today has ever experienced war on your own soil. I think many Americans take freedom and democracy for granted. (@nursej22, I know I quoted your post when I started my post, bit somewhere along the way this post morphed into being directed at everyone and no one in particular. I don't intend for this post to come off as me trying to lecture you). The problem here isn't a difference of opinion. It's that you can't even agree on what is true and factual. As a country you are alienating your traditional allies and expressing admiration and sucking up to authoritarian leaders. You are withdrawing from international treaties designed to make the world a better and safer place for ALL OF US. I watched someone on the TV the other day say something that I think was a very accurate conclusion. I can't remember who the person was or what his qualifications are, but he was in my opinion right. He said that Trump views the world as a zero-sum game. In his mind if it's France +2, that automatically means that it's U.S. -2. That of course means that he has to lash out at France in one form or another. He can't grasp the fact that multilateral deals and cooperation between countries actually leads to France +2 and U.S. +2. It's definitely true that no poster has ACTIVELY defended each and every lie or vile remark. The thing is though, if a poster repeatedly links to obviously inaccurate sources (ie LIES) and keeps on doing it even after it's been pointed out to them, AND they defend let's say a third or a fifth (or whatever percentage) of the lies and vile remarks, I WILL draw my conclusions. I don't require a 100% perfect track record. It's not primarily the opinions that bug me, it's the willingness to embrace and perpetuate lies and the refusal to cede even an inch, even when they are demonstrably PROVEN to be wrong. No, and unless things drastically change, I don't think it's likely you'll see it happen. Back in the day when I'd regularly placed people under arrest, I would rarely celebrate the fact that Perp101 that I nabbed for assaulting John, Matt and Peter, didn't also beat up Mike and happened to have donated $100 a worthy charity the morning of the assault. Sure, giving money to a charity is a good thing and I guess that at least Mike could argue that not being beaten up is a good thing. But ya'know.... I was still kind of miffed that Perp101 had beaten John, Matt and Peter. So I didn't place an ad in the local paper recognizing Perp's generous donation. (I'm not claiming that the things Trump does are the equivalent of felony assaults (or any kind of crime). My example was just to illustrate good/positive vs bad/negative deeds and why you in some instances won't get much credit even when you manage to perform the odd positive act. I haven't in honesty seen that many of them, just trying to be generous here). I could not agree more. Oh, Tweety! Did I read this right?? (You know English isn't my first language, and I'm hoping I've misunderstood). Since I'm not an American I have no idea who I should urge you to contact, but I hope that you are getting help if you're dealing with feelings like this. If you haven't already, please reach out to someone who's in a position to help in real life. No one should have to struggle with thoughts like you just described, alone. Hugs my forum friend! Take care! If I've understood things correctly, impeachment proceedings would be initiated by the House but would ultimately end up in the Senate where they'd need a super majority in order to convict. Is this accurate? Whether impeachment is justified or not, seems to be a moot point considering how unlikely it is that two-thirds of the current Senate would support it. Perhaps when and if Trump is found to have done something so truly bad that enough sycophants and enablers will finally abandon him, but right now I'm not seeing it. At this point in time, I think all that impeachment proceedings would result in, is yet another bout of victimized whining about being persecuted by the left. It would just be more of the witch-hunt narrative. It just gives them a chance of doing a repeat performance of the Kavanaugh spectacle with a ton of butthurt, melodramatic umbrage on display. I'm sick and tired of listening to their symphony orchestra consisting entirely of teeny-tiny whiny violins... If this was my government, for now I'd want Democrats to try to implement policies that are important to the voters, as best they can considering the political/partisan "profile/mix" of the current U.S. Congress, and use the various House committees to investigate matters that sorely needs investigating. (The list is long). Of course it's impossible to for us forum posters to ascertain the individual danger each and every person in than caravan poses. Statistically speaking, as in any group of thousands of individuals regardless of ethnicity, there are likely a few shoplifters, someone who's committed an assault, perhaps a few rapists and definitely folks who've jaywalked or haven't paid their parking tickets or committed similar minor legal transgressions. These people are also all around you already. What do you really know about your friends, coworkers and neighbors? The point here is if the threat is of such a nature that can't be dealt with through the normal vetting procedures and investigating done by border/immigration/law enforcement authorities? Is there really evidence that this needs to be met with the might of your armed forces? I don't see any and it doesn't seem that the threat assessment done by your military points to that either. I think it's a safe bet that the deployment of troops to the border is 100% politically motivated. It kinda is a white thing... Are you arguing that Trump voters aren't more likely to be white, male and not have a college degree than being black, female and having a college degree? You'd be wrong if you were. Of course not every single person who voted for Trump is white. I don't think anyone has tried to say that. However, even though members of all minorities voted for Trump, a Trump voter is more likely to be white than a Clinton voter is. Do you think that a white person (please note that doesn't mean every white person, just a random white person) is more likely to agree with the claim that judges of Mexican heritage can't perform their duties in an unbiased way because of their heritage or that Mexicans are rapists, than a random hispanic would? Expressed a different way, which demographic do you think are more likely to agree with statements that are inherently prejudiced against hispanics? Whites or hispanics? Again, please understand that if you identify one group as being more likely to agree, it doesn't mean that each individual belonging to that group shares that view. The fact that some white people are racists doesn't mean that every white person is racist, but it's foolish to pretend that no white people are racists. Behind Trump's victory: Divisions by race, gender and education Educational divide in vote preferences on track to be wider than in recent elections Education, Not Income, Predicted Who Would Vote For Trump | FiveThirtyEight (the first two links are from one day after the 2016 election and september of 2016 respectively and the last one is an analysis of the results published on Nov 22, 2016. I find the fivethirtyeight one really interesting if you take the time to analyze the numbers). Again with the General? Why are you incessantly asking posters if they disagree with his statement? I can neither agree nor disagree with his statement. It's so vague that I don't even know what I'd be agreeing or disagreeing with. I'm surprised that isn't obvious to you. It should be obvious to anyone. I obviously don't know the General and have no idea what prompted him to phrase his statement the way he did. But let me tell you, it's exactly how I would phrase it if I was a four-star general, who realized that it would be a really stupid career move to release a statement that boils down to that I think that my Commander-in-Chief is exaggerating or lying about threats. I'd write something vague and noncommittal. For the umpteenth time. There's nothing in your quote that warrants deploying 5,000-15,000 troops. What do you picture the military doing anyway? They can't act in a law enforcement capacity on U.S. soil and the refugees aren't exactly arriving in M1 Abrams tanks. Migrant Caravan: Border Troops Preparing for Threat of Armed, Unregulated Militias, Leaked Documents Show Please note that historically only about 20% of the total of refugees and migrants in the caravans, ever reach your border. The military appear to be more concerned about the unregulated militias who've taken upon themselves to "help" the trained law enforcement and border protection professionals who safeguard your borders on a daily basis. I'm pretty convinced that these professionals would be happier if the yahoo militia types stayed away. The militias will in all likelihood only make their job harder and more dangerous. The militias have likely been galvanized into action by this irresponsible and untrue talk of an "invasion", when in fact we're talking about refugees and migrants. And of course, they probably feel real tough with their pretend uniforms and guns. What a farce.